Well, that was a base under siege story enlivened with a nicely creepy atmosphere, a dash of timey-wimey plot diddling and some good performances from both the main and guest cast. Written by Toby Whitehouse it didn’t quite have the panache of Series 9’s first story, ‘The Magician’s Apprentice/The Witch’s Familiar.’ But it did feel sufficiently Moffatesque that it couldn’t have really come from any other era in the programme’s history, even if the ‘base under siege’ is a Doctor Who staple. There’s something about the scenes with the Doctor and Bennett (Arsher Ali) watching their earlier selves that are signature Moffat era, even though it wasn’t written by him. ‘Under The Lake’ also features an absolutely brilliant cliffhanger. Because New Doctor Who doesn’t do huge numbers of multi-part stories there aren’t a lot of cliffhangers but this one is a peach. And it makes you realise that sometimes Doctor Who is the Columbo of science-fiction series. We know, however bad the cliffhanger makes things look, that the Doctor is going to get out of this corner, but what we want is a good explanation as to how they* do it. This cliffhanger is fabulous. 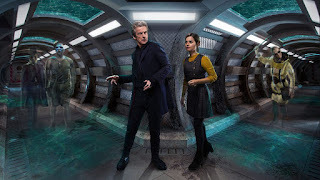 The Doctor’s get out doesn’t quite match it, although the seeds for it are sketched out throughout ‘Under The Lake’ and then explained in ‘Before The Flood’. Perhaps cliffhanger disappointment is a regular thing for Doctor Who fans. ‘Under The Lake’ does all the heavy lifting as it introduces us to characters and then bumps them off. Indeed, one of them – Moran (Colin Macfarlane**) dies before the Doctor and Clara even turn up. Except for the slightly cliched capitalist greedhead Pritchard (Steven Robertson) who the Doctor gets to treat with exactly the right amount of contempt you would expect they’re a sympathetic bunch, which makes you care – at least a little – as some of them die. I think one of Whitehouse’s strengths here is that you feel that this is a crew that knows and likes each other. It includes Cass (Sophie Leigh Stone), who is the temporary base commander after Moran’s death. The interesting thing is that Cass is deaf. She can read lips but has a sign translator in Lunn (Zaqi Ismail). No one quibbles about her ability to do her job and it adds a certain frisson to a scene in ‘Before The Flood’. Sophie Leigh Hunt does an excellent job too. There’s a lovely scene between her and Jenna Coleman after they’ve sent Lunn off to do a dangerous job. Her anger is rather lovely. Talking of Jenna Coleman – he says, shifting topics with all the subtlety of a Panzer Tank – this is the first story where her behavior is starting to concern the Doctor. We hear of the Doctor’s ‘duty of care’. Once again Coleman is rather wonderful. I know people have issues with Clara as a companion, but I think Coleman’s performance is top notch. And since Moffat’s let go of the ‘mysterious Clara’ stuff she’s blossomed. 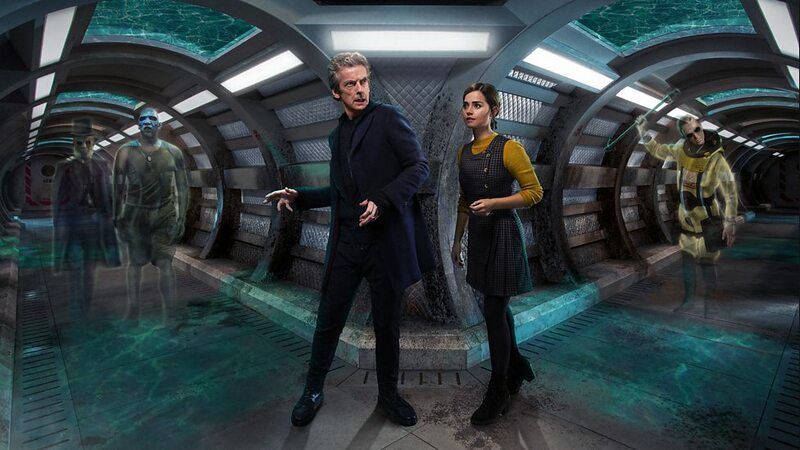 And her and Capaldi make such a good team. And Peter Capaldi too is brilliant. He nudged Tom Baker off the top spot in my favourite Doctor list and I love everything he does here. 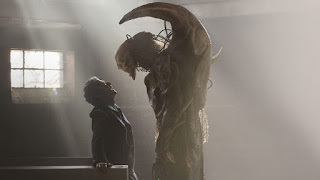 Yes, sometimes there are things which I think seem unnecessary – the cards here for example – but Capaldi’s acting just hammers home scene after scene. I think he’s the best actor – alongside Troughton and Davison – to play the part. And he’s got real charisma too. ‘Before The Flood’ introduces us to Prentis (Paul Kaye), a Tivolian undertaker. The Tivolian’s being the slightly rodentesque most cowardly race in the universe introduced in ‘The God Complex’. And, more importantly, The Fisher King (Neil Fingleton) who is the villain of the piece. We are also introduced to the concept of ‘the bootstrap paradox’ via a nice little lecture to camera by the Doctor. It’s an interesting beginning to an episode that lecture. It gives us a little rest before throwing us back into things. A kind of palate cleanser before we’re back into the adventure. Indeed, it will turn out that this story is a variation on ‘Time Crash’, but without the other Doctor. The Doctor’s solution to his very real difficulty is already known to him because he’s seen it. So, he just does what he’s heard or seen already. Who then came up with those ideas? It’s quite philosophical a theme. You can imagine courses in Gallifreyan Universities on bootstrap paradoxes. The Doctor – as usual – works things out. Perhaps one of the weaknesses of this story is that although it has a delightful level of creepiness, particularly in ‘Under The Lake’ the Fisher King himself never feels that much of a threat. And the Doctor’s victory seems to have come at minimal cost, for him. But not for Bennett, who seems to suffer the most at the loss of O’Donnell (Morven Christie). He uses that loss to…well...spoilers. So overall an enjoyable couple of episodes without being spectacular. And there’s nothing wrong in that. If every Doctor Who story was spectacular we’d have to adjust our expectations and something would end up not being quite so spectacular. *I have just realized that the advent of Jodie Whitaker’s Doctor means that the default ‘he’ for Doctors just doesn’t apply anymore. Ah, change. **Who I just saw being brilliant in Pinter Five at the Harold Pinter Theatre in London, particularly his two-hander with Rupert Graves in ‘Victoria Station’, which is funny as hell.